These strength and beauty quotes will give you lots to contemplate. True strength comes from within, and so does beauty! Both physical strength and beauty can fade with time, but it is your inner qualities that persist and last throughout your life. It is great to be physically strong and look beautiful, but it is greater to be strong and beautiful inside. It is these inner qualities that make you a better person, help you achieve higher goals in life, add more meaning to your life, and help you build stronger bonds. Everyone cherishes the company of a person who is both strong and beautiful inside. It is always an enriching experience and the wise understand the importance of these qualities. Here are some famous quotes that will help you learn more about the value of these qualities and they may also inspire you to set course to a different kind of goal in your life – something that will matter forever! Physical strength is measured by what we carry. Inner strength is measured by what we can bear. it’s the easiest thing in the world to do. we gain strength, courage, and confidence in the doing. Life only demands from you the strength that you posses. Be strong and of a good courage, fear not, nor be afraid of them: for the LORD thy God, he [it is] that doth go with thee; he will not fail thee, nor forsake thee. You’ve got to follow your passion. You’ve got to figure out what it is you love–who you really are. And have the courage to do that. I believe that the only courage anybody ever needs is the courage to follow your own dream. Courage is looking fear right in the eye and saying, Get the hell out of my way, I’ve got things to do. And once the storm is over, you won’t remember how you made it through, how you managed to survive. You won’t even be sure whether the storm is really over. But one thing is certain. When you come out of the storm, you won’t be the same person who walked in. That’s what this storm’s all about. 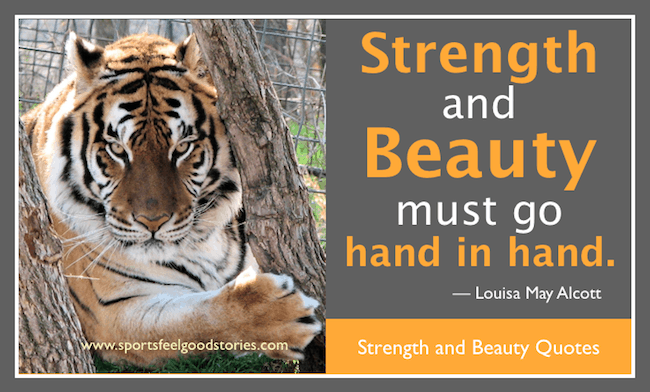 Tip: Some of these strength and beauty quotes make great photo captions for scrapbooking, Facebook and Instagram. It’s [beauty] a kind of radiance. People who possess a true inner beauty, their eyes are a little brighter, their skin a little more dewy. They vibrate at a different frequency. The fountain of beauty is the heart and every generous thought illustrates the walls of your chamber. I think beauty comes from within. If you’re happy and look at life in the best way you can, even when there are problems, it can make you beautiful on the outside. If you have any suggestions for strength and beauty quotes, please let us know. Outer beauty attracts, but inner beauty captivates. Your outer beauty will capture the eyes; your inner beauty will capture the heart. Beauty isn’t about having a pretty face. It is about having a pretty mind, a pretty heart, and most importantly a beautiful soul. You’re on Strength and Beauty Quotes page.